This piece first appeared in CIO. Can you even remember the last time any part of your organization measured success without data? If you can, it might be uncomfortable to recall. As today’s marketplace standardizes modern business intelligence, and as self-service continues to move the power to perform analytics from the hands of the few to the many, it comes as no surprise that data skills and literacy are now considered fundamental for scaling the enterprise. Data-driven organizations everywhere are racing to hire industry analysts, and yet they’re finding themselves up against what seems to be a mission-critical talent gap—right now there are more than 60,000 data analytics jobs listed on Indeed.com but more than 40% of managers reporting having difficulty hiring analytical talent, according to a recent MIT study. In 2011, the global business consultancy McKinsey predicted a shortage of as many as 1.5 million analytics managers by 2018. The good news is data-driven people are everywhere. Not only are people becoming more data curious and literate in their everyday lives and workplace, there’s also a significant uptick in broader analytics education that complement a variety of curriculums, degrees, and already active careers. 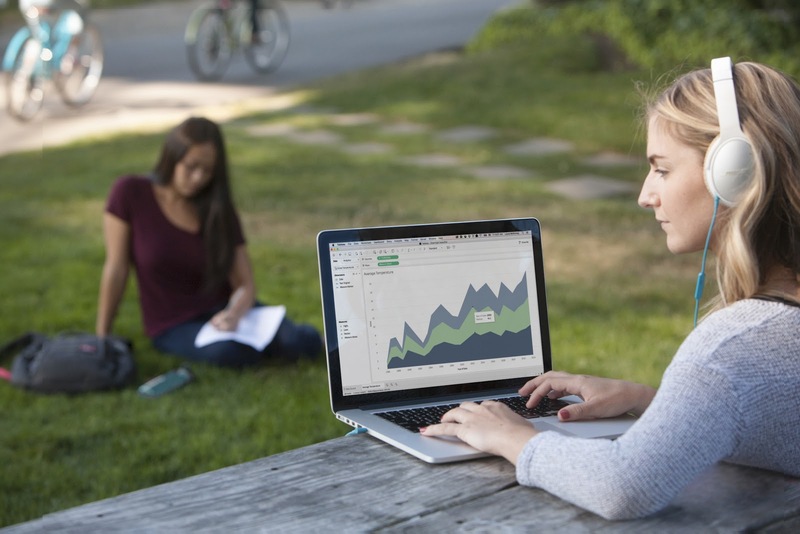 There are almost 2500 analytics programs offered in 705 colleges in the U.S., and over half of those programs were newly created since 2010, according to recent study conducted by Tableau. The world is starting to see an emergence of the data boomers— an analytics and insights-savvy generation—ready and excited to transform the workplace. The new data generation has developed a core competency in analytics as part of their general education and evolving career skills. They will pursue or already have jobs in many different sectors like business, science, manufacturing, and retail. They will work in every field and in every department, not just in centralized analytics or business intelligence teams. And they are hungry to use their data skills to make an impact. Here are five ways today’s organizations can harness and unlock the potential of the data generation. If a CEO writes a company update letter that says “I think we should do X based on my experience and opinions” versus a CEO who writes the same message with “The data suggests or supports our next path forward,” which CEO gets more buy-in? (This is a trick question). It’s the latter, of course. Senior leaders must play a key role in moving the company beyond a need-to-know mentality by truly practicing a data-driven approach themselves, or else risk undermining the entire transition. Executive sponsorship of self-service can outwardly support data-driven decision-making and help develop the right partnerships between IT and business users. Many enterprises today are creating data-hubs where workers can search for, connect to, and use the data they need, all within the right security and business context. When you implement the right technologies and tools, and teach everyone in the company how to use them, you make data the baseline of all conversations. Fostering the data generation begins at the top. Data people want to work with data. Current and new employees have the presumption that data is available. They want to use it in their daily reporting and ad-hoc analysis to help foster informed decision making. Yes, the data generation will contribute to building a culture of analytics, but it also means that organizational policies and procedures around data governance must be revisited to ensure your data stays safe and secure. Data governance is not about locking everything down to a few privileged users in each department; it’s about enabling broad groups of users with the appropriate controls. When done properly, data governance will provide a set of tools, processes, and rules of engagement to ensure that anyone can have the access to the data they specifically need to answer their own questions. Although data governance is often driven by IT, it is the responsibility of both business leaders and IT leaders to work together to define these tools and rules, so that governance functions for the entire enterprise—and that the rules are followed. From authentication and permissioning, to certifying data sources and content, everyone must embrace the freedom of governance. People bring data insights to life. So your people, their creativity and unique expertise, are especially important for bringing your data to life. Because technology progression can happen very quickly, the adaptability of an organization to leverage that technology will continue to be a differentiator in the market. Lowering barriers and making data as easy and intuitive to consume is critical for employee adoption. Deeply focus trainings by using department specific data— not an obscure or unrelated data set. This derives a higher level of interest during the learning process, and the additional business context will make the leap smaller for newer users or those struggling with the process. Another exercise is to hold a company-wide, executive-sponsored competition with data, where employees can show off their data skills, be judged, and learn from their own work. This approach attracts workers who are eager to improve their skills, and those who may have been previously intimidated to learn. Finally, it’s important to note that both role-specific analysts and departmental workers with data skills are required in the modern organization. If you only hire dedicated analysts and data scientists, and they are solely tasked with answering the organization’s questions, you’ll create a bottleneck that leaves a non-analyst worker with unanswered questions. If you just hire business users who are trying to answer their own questions with no model for analytical best practices, they stop asking those questions, too. Always remember: these two groups are supportive of one another, not in opposition to each other. Many enterprises will build and establish a center of excellence (COE), a team and knowledge base to provide leadership and core best practices for analytics. A COE will act as a resource for users to look to for guidance and trainings, and it should align to the self-service model within the company’s BI strategy. Your organization can take it a step further by building and nurturing a highly active internal community around the COE. While successful COEs will have the right leaders who deeply understand the tools and data visualization, internal communities will be inclusive of any person within the organization wanting to participate in any way. Internal forums and help desks with regular office hours will centralize a knowledge base for people to get their answers quickly answered by their peers, and internal user groups and meetups will offer more opportunities for people to gather, present, test, learn, collaborate, and motivate. These types of shared experiences will draw the masses, allowing self-service users to help each other along the way. The inherent support and camaraderie that comes with an internal data community can be a monumental force for building a culture of analytics, and it will also substantially reduce the time to a full transition for modern analytics in the enterprise.